Yes, admission into the Rock n Roll Hall of Fame is purely subjective. It is a club, and the powers that be will only admit those which they approve. You could see this coming. A mutual friend of ours once said back in the mid-90's, "Let's go visit it now before they contaminate the place." Well, that is exactly what has happened. What do they have against some of these people? The Moody Blues (too pretentious? ), The Guess Who (singles band? ), Chicago (sold out in the 80's? ), Chubby Checker (not Hank Ballard? ), Tommy James (bubble gum?). Anyway, the most obvious case of bias is against the Monkees. The Monkees have long been looked down upon by the rock establishment as a phony band, but let's take a moment and compare them to The Supremes. The Supremes were wonderful but they didn't write their own music, they didn't play their own instruments and they were created and financed by Berry Gordy. They were even sent to charm school! In other words, they were manufactured. Isn't that the complaint about The Monkees? Now, the Monkees string of hits may not quite match The Supremes 12 national #1's, but the Monkees' run, as you pointed out, was damn impressive. And they did wind up writing their own material and playing on their albums (which many major, well respected bands did not.) Nesmith even wrote and placed songs with others. Ronstadt's "Different Drum" and "Mary, Mary" with The Paul Butterfield Blues Band, who, ironically, are being inducted this year! HOF inductees can be debated in sports like baseball, but at least there, some basic, objective levels of achievement must be attained (eg, 500 homers, .300 average) but in music it is totally subjective and success can actually be held against you! I think the ballplayer who said it isn't worth worrying about things you can't control was former NYY centerfielder, Mickey Rivers. He just might have been right! Enjoy the holidays! Here are Billy Joel’s thoughts on Joe Cocker and a video to support it from Madison Square Garden. The Vince Vance Christmas song you posted, is played here in OKC. I guess maybe you are right in that the same Christmas songs are played over and over again. My car radio doesn't work and even though I could get it fixed, I haven't. To be honest with you, I have not missed listening to it at all. Same music heard over and over again, as well as the same old same old on the talk sports stations. Incidentally, hearing Vince Vance's name reminded me of his tune BOMB IRAN. Hadn't heard it in years and had to get it out and play it. As for the non-stop Christmas music, it has FINALLY come to an end!!! We went out to dinner on Christmas Eve and driving home I literally turned off Bing Crosby's "White Christmas" four times in a span of fifteen minutes. I’m overjoyed to share with you and your readers the news that FREDDY “BOOM BOOM” CANNON has made a terrific recovery from his quadruple by-pass surgery in Los Angeles from about 10 weeks ago. So much so, that he will return to performing on two rock and roll cruises in February with a bunch of his colleagues, including Gary Lewis, Gary Puckett, Johnny Tillotson, Little Peggy March, Bowzer and others. I’ve attached a link below. Lost amid the well-deserved accolades for Joe Cocker these past few days, Larry Henley of The Newbeats is also now "singing on the other side." He was 77. In addition to his work with the hit making group and his distinctive falsetto, he was also the author if the astoundingly successful "Wind Beneath My Wings," a song somewhere between charming, trite or "irritainment," depending on one's perspective. But he (and Dean and Marc Mathis) left some indelible and muscular pop / rock and roll behind. My favorite Newbeats song is the low-charting "Shake Hands and Come Out Crying" (1966) which was written by Doug Kershaw ("Louisiana Man"). It sounds a lot like Kershaw's "Ain't Gonna Get Me Down" from '67, Country label K-Ark's most pop-oriented 45. I'll send you both tracks shortly if you wish to post them. Thanks for all the great posts, research and comments. I may not write as often as I'd like, but I do check in frequently! Sad to hear about Larry Henley's passing. That voice was amazing. Although "Bread & Butter" was the big one, my first real Newbeats fave was "Run Baby Run" and later, "Groovin" and "Laura" became my faves by them. Give a listen to them both!! See if you don't like them. I helped with the Varese release of their hits back in the 90's (2000's?). Larry's death rivals Joe Cocker for me. People don't know Larry's name well because he was always in a group, but his voice was always unmistakable, as was Joe's. Both have songs I just cannot live without. Larry Henley, falsetto lead singer with the Newbeats on their hits "Bread And Butter" (#2 - 1964), "Run, Baby, Run" (#12 - 1965) and "Everything's Alright" (#16 - 1964), died Thursday (December 18) in Nashville. The Arp, Texas native was 77 and had been suffering from Parkinson's and Alzheimer's Diseases. Larry joined with Dean and Mark (Mathis) who had a hit with their version of "Tell Him No" (#42) in 1959 to form the trio, which charted ten times themselves. Larry later became a well-respected songwriter, best known for Bette Midler's hit, "Wind Beneath My Wings" (#1 - 1989). He also co-wrote Tanya Tucker's crossover country hit, "Lizzie And The Rainman," (#37 Pop, #1 Country) from 1975. Larry was inducted into the Nashville Songwriters Hall of Fame in 2012. 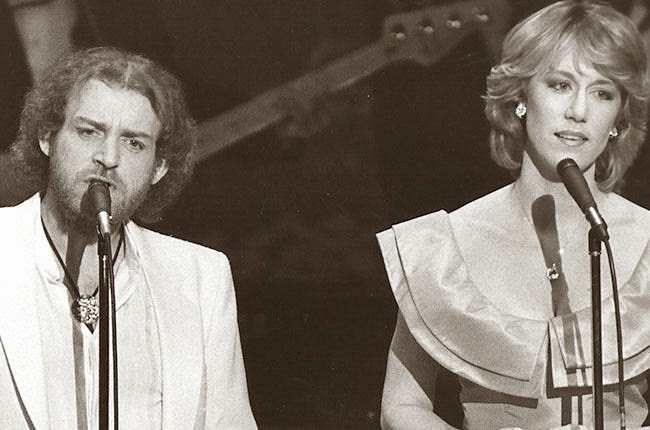 Joe Cocker and Jennifer Warnes perform at the Academy Awards in 1983. When I was teenager there were three large posters of famous people on my bedroom wall -- Bob Dylan, D.H. Lawrence and Joe Cocker in the middle of a scream in concert at Woodstock. The picture of Joe frightened my mother, but I reassured her. "No mom, he's an emotional visionary." I didn’t know then, but I know now, that if you wish for something with your whole heart, it has a pretty good chance of coming true. In the early '80s, other than a few great pairs such as Ella and Louis, Loretta and Conway, duets were not common on the charts. Music that year was weighted down with synthesizers and rhinestone jumpsuits. I was home watching one of those less than wonderful Grammy telecasts when Joe appeared singing "I'm So Glad I’m Standing Here Today" with the Crusaders. His voice was like a knife cutting through me. He laid his heart right on the table. I also knew right then that we would sing together. Then that beautiful song by Will Jennings, Buffy Sainte-Marie and Jack Nitzsche fell into our hands. The movie wanted us. Things just fell together. I agree that the pairing of a rough Sheffield blues guy with a folkie-pop girl seemed odd. To make it worse they dressed me in taffeta, Joe in a suit, it was crazy. We looked like two prom kids, not like Ella and Louis. But in 1983 we toured the big wide world and never lip-synced once. That was our rule, no lip syncing. Every performance was the real deal, a free falling skydive. Geronimo! Joe took his liberties with the song and I chased after. Singing with Joe was often risky and always thrilling. Those are great memories that I will keep in my heart. With a new dread, I realized yesterday that we will never sing our song again. That thought makes me feel sick. We met last year in Berlin to sing together. I didn't know that would be our last time. Joe won my heart completely when I first saw the movie Woodstock. He won millions of hearts with that film. But it was a young girl's dream come true to later become Joe’s singing partner. I will always love him and always miss him. Jennifer Warnes and Joe Cocker's 1982 collaboration "Up Where We Belong" for the film An Officer And a Gentleman won an Oscar, a Golden Globe and netted them both the Grammy Award for Best Pop Performance by a Duo or Group with Vocal. It also topped the Billboard Hot 100. Thanks for the link and the mention on Joe Cocker. I'll never know how anybody can sing so good. And thanks for listening. Have a great holiday. I was never fortunate to see and hear Joe Cocker in concert, and can't remember if he ever performed in this area. The closest I came was viewing the movie, "Woodstock". We had a Cinerama Theater that made you feel like you were sitting in the middle of the crowd, so it was a mind-blowing experience! Ten years ago, I got to see the Trans-Siberian Orchestra, for the first time. If you have never seen one of their shows, by all means, do it! The first half of the concert is a holiday story, with all the rock-edged Christmas songs and laser light show. After the intermission, it's a rock concert. That year, one of the vocalists sang "With a Little Help From My Friends", ala Joe Cocker. Their cover had the same original vocal and instrumental backup, and it ROCKED the auditorium! The lead singer even had a slight resemblance to Cocker. As I took it all in, I wondered what it would have been like to witness the genuine article. The music world has lost another one-of-a-kind icon. Clark Besch had mentioned last week that he was going to contact Bobby Jones, formerly of Chicago band Aorta and then, later, a member of Joe Cocker's Mad Dogs And Englishmen back-up band. Got this from Bobby Jones of the Mad Dogs & Englishmen band Joe toured with back when "The Letter" was out. He's also in the film and album cover. Forgive me for not getting right back to you - we had full house (25 family & friends) for Christmas, and I was a little busy. Joe Cocker was one of the kindest, gentlest characters I ever knew ... to put it simple, we are talking about one fantastic guy. It's terribly sad to lose him. I still haven't read the whole deal, but I DID hear that it was lung cancer. He smoked when I was around him, (and almost everyone on our tour did too, btw), but everybody I knew quit -- at least cigarettes. But evidently, he didn't. It's fairly amazing ... it just makes me shake my head. He was an incredibly intelligent cat, too; I just don't get it. It's a little bit like Herbie Rich, when I got the news. I always figured we'd hang out again. It's interesting that I would mention Herbie in that context - Joe drove me to the airport to pick up Herbie one time, when Herb came out here. But Joe has not been "silenced" ... his voice will be heard for a very long time. It's a lot like Ray Charles ... I wish you could've seen Joe anytime anyone was talking when a Ray Charles cut would come on the radio. Joe would say, "Wait a second - that's Ray ..." And anybody around would shut up until the end of the song. Another reason why I can tell you about what a beautiful guy he was - we LEARNED MORE about listening. Don't you wish that everyone did that? I would have to agree with the other reader that you pretty much nailed it with the Joe Cocker tribute. I would like to add a few thoughts from my own experiences. I was fortunate to have seen Joe Cocker perform at the Fillmore East in NYC a few times early in his career (late 60's to early 70s). I was pretty much a regular at the Fillmore. I had heard the song, "Feeling Alright" but I wasn't familiar with Cocker's "style" of performing. (I don't think many others in the audience were.) My initial reaction was "Whoa." I was taken back as I think most people were who saw him in the early days. I thought his singing was great but there was much more to him than just great singing. He had to be seen! He just blew everyone away in that theater. Most had never seen anyone like Joe and probably never will again. He was unique and the audience was mesmerized by his creative ability to mix the theatrics with his singing. I guess initially that they were trying to figure out, like myself, if he was pardon the pun "feeling alright." Once we figured out he was very ok, we all enjoyed the show with bewilderment of how someone could do those crazy contortions or why would they even want to. That was the first time. When I saw him the second time, I like the others there, looked forward to his act. We knew full well that we were in for a treat and even got a chuckle. Like Michael Jackson, there will never be anyone like Joe Cocker. Anyone else will be an intimation. He will be missed. Have a very Merry Christmas and almost an insanely Happy New Year! Hope you and your family had a great Christmas Day. I don't know if you saw it today, but on the NBC NIGHTLY NEWS they did some sort of segment that was Christmas related. Can't really remember offhand what it was about, but what caught my eye, er ear, was the background music that was playing very briefly. It was the instrumental BUMBLE BOOGIE out of 1962 by the group B. Bumble & the Stingers. If it wasn't the original recording, it was a very close second. And, speaking of the song BEND IT, here in the OKC area the song itself was recorded by a local garage band by the name of the Noblemen. The record came out on the label CJL Records and for the week of March 16, 1967 peaked at #2 here in the OKC area. Now the flip was a song called STOP YOUR RUNNING AROUND and lots of people in the music business here in the city thought that that songwas the better of the two. Without doing any research, I believe I heard one time or read that actress Barbara Eden (of I Dream of Jeannie) recorded the song as well. "Bend It" got a TON of airplay here in Chicago yet never officially charted. I probably heard it more on my MOM's station than mine ... for some reason Howard Miller and WIND were all over this song! It never made Billboard's Hot 100 Pop Singles Chart yet EVERY TIME we feature it, we get emails from readers all over the country who fondly remember the song. Click here: Rewound Radio: It's not how old it is... It's how GOOD it is!! I just finished reading a new book entitled “The History of Rock & Roll in Ten Songs” written by Greil Marcus. He does a good job of unlocking some of the reasons behind the those hits. Thought you might enjoy reading it. PS Merry Xmas and a great 2015! There are a few points made therein that go beyond the standard screed, of which we are all familiar. By the way, the unnamed artist that is cited in the piece whose first album was shelved, but generated $200,000,000 in revenue on her first official release was Sheryl Crow. Thank you, Kent and Friends! I have enjoyed every Friday. Memories of delight! I thoroughly enjoyed each and every Saturday Survey feature this year. Thanks to Clark B and others who provided material, and of course a big thank you to you, Kent, for putting it all together for us. And hey, the Fifty Years Ago Friday feature was great fun too! Hope your 2015 is grand! Here's the thing about the 60's and early 70's ... growing up, the 60's radio was different than it is now ... we had the awesome thing they don't have today: Top 40 Radio! Today, you might hear someone say they like a song and it would be easier to say "Oh they like that kind of music", because most of today's music is the same. We heard the songs that Kent plays every day and they might be "Purple Haze", "Skip a Rope", "It Tears Me Up", "Magic Carpet Ride", "You Gotta Be Loved", "Snoopy Vs. The Red Baron", "Walk Away Renee", "The Weight", "Mr. Businessman", "Can't You See Me Cry" and "Delta Lady" back to back, just as you COULD hear them in the 60's. It was hard to pigeonhole a listener, because we grew up loving ALL of these sounds coming from our tinny tiny transistors! It was great working with you on the Saturday Surveys. I know it was sometimes stressful for both of us to hit deadlines ... but I enjoyed seeing my charts up there to share. Looking back at those charts was a trip back in time each week ... and you're absolutely right ... it was the magic of ALL these different styles of music, existing side-by-side, that made growing up in the '60's and '70's, listening to the radio, such a life-altering experience ... we were exposed to it all. It didn't really matter if we liked it or not ... we all have our personal favorites ... but the fact that it was all put out there for us to digest is what made it such an exciting time in radio. Add in the days of "Personality Radio" where we hung on the deejay's every word and kids growing up today will NEVER understand why this music and this era meant so much to us. I should have been so lucky, Kent lol. It is Geoff Dorset with the interview and show. Mojo ... Or, Perhaps More Accurately ... Mo' Joe!